Experience prompt and reliable service when you rent a car, our Honda CRVs or 4×4 jeeps. Our friendly staff will give you directions and tips as to where the best sight seeing is. Visiting for Carnival, wanting to discover the rainforest or just touring Grenada, we can help with our 24hr service! We deliver to hotels and the airport! McIntyre`s rent out nice reliable Honda CRV SUVs with Air Conditioning. To understand, appreciate and satisfy the needs of our customers and our community by providing products and services of the highest quality, backed by an enthusiastic team, trained and dedicated to provide excellent service at all times. We believe that satisfied customers are most important to the development of our company. Experience prompt and reliable service when you rent a car, our Honda CRVs or 4×4 jeeps. Our friendly staff will give you directions and tips as to where the best sight seeing is. 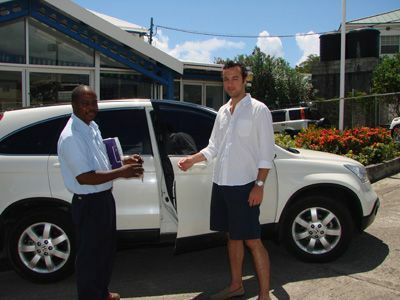 Visiting for Carnival, wanting to discover the rainforest or just touring Grenada, we can help with our 24hr service!